When asked on Career Day what she has in mind for her future, tenacious student Barbara Thorson readily replies: “I already have a ‘career.’ ... I kill giants.” She knows firsthand that giants aren’t just mythical—we face them in everyday life. Unable to accept that her mother is dying of cancer, Barbara employs an elaborate fantasy world to block out reality. But although this feisty pipsqueak has the courage of ten men, life proves that some giants we face can’t be beaten, but must simply be endured. It’s a little difficult figuring out what’s going on during the first few chapters. The scene introducing Barbara’s family throws in too many characters at once, some that don’t reappear for the rest of the graphic novel. We don’t yet know that Barbara’s mother is bed-ridden due to the advanced state of her cancer, so we’re left to wonder if Karen, the young woman fixing dinner, is her mother or older sister, or if the entire gaggle of teenage boys playing Dungeons and Dragons are her brothers, or just her brother’s friends. Barbara is also shown throughout the graphic novel to sport either bunny ears, cat ears, bear ears, etc. Anyone familiar with anime (the drawing style of the graphic novel) will recognize that this is a frequently appearing trait among anime characters—why this occurs is anyone’s guess. Anyone not familiar with the “animal-ears” trait will surely be extremely confused. Why does Barbara have bunny ears when the rest of the characters don’t? The answer becomes clear after the story settles down and the reader becomes familiar with the storyteller’s rules: Barbara spends most of her day in a fantasy world populated with giants and fairies. Why shouldn’t she have bunny ears? It’s only after you get past this stumbling point that the reader is finally able to sit back and enjoy the story. The thought of life’s obstacles manifesting themselves as giants is really quite clever, and makes Barbara’s struggles more endearing. 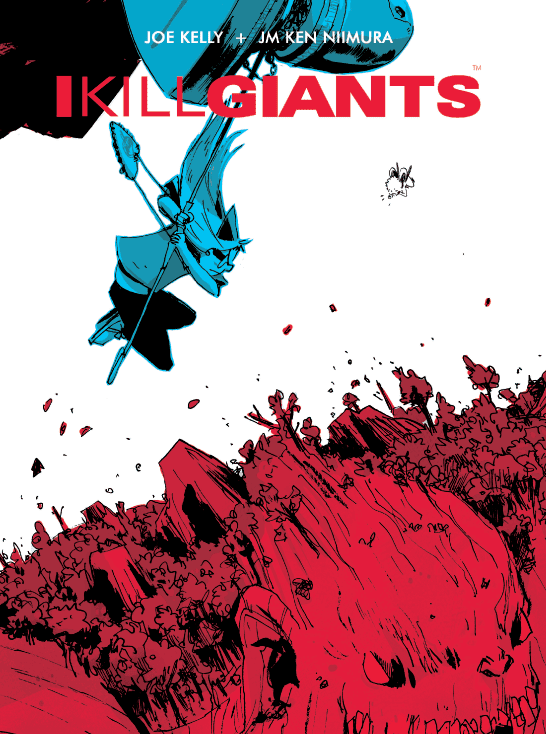 I Kill Giants is a whirligig of a tale, a magical story about a kooky, brazen little girl who deals with life’s tragedies the only way she knows how: by fighting them. Recommended for Ages 13-Up.